HURFOM, Mon State and Karen State: In a significant display of anti-election sentiment, three communities in Kyainnseikyi Township and Ye Township have held large anti-election rallies within two days of each other. According to participants, all three rallies were held because none of the communities had heard of any previous instances of open protests to raise awareness about ongoing election-related abuses villages in their area had experienced. Protesters hoped that, despite the risks, because of their actions other communities would more openly display their discontent with the State Peace and Development Council’s (SPDC’s) current election practices. On October 23rd residents from surroundings villages arrived at 6AM in P— Village, in Kyainnseikyi Towship, Karen State. There, participants, who were predominately Karen but also included some Mon and Loa-Shan community members, held large red banners bearing anti election slogans while a protest organizer spoke and lead them in anti-election chants. The protest, conducted in a guerilla style which community members arriving quickly and dispersed before any reprisal action was taken, was conducted within two miles of an SPDC Light Infantry Battalion (LIB) base. 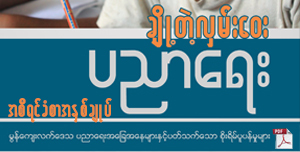 The nearly 600 participants all came from areas banned from participating in the November 7th election by a directive from the Burmese State Election Commission in September, citing section 8 (f) of the Union Election Laws, that supposed security risks were to great for the election to occur in that area. The protest was conducted as a result of this ban, and residents’ resulting concerns that the communities had no fair or genuine opportunity for representation in the upcoming election. According to the protest organizer, the location was chosen because of the presence of the near-by battalion; the open protest was meant to send a message to the local battalion and to Napiydaw. Yet despite the brazenness of the 5 hour rally, the near-by battalion has not yet taken any retributive measures or reacted in any way. The slogans that protesters chanted over and over again when they were marching were for people to pull down the dictatorship system, to set up tripartite dialog, and to become a real democratic country. Most of the protesters also chanted this “We want NO 2010 Election”. At this protest [we] cared whether it was secure or safe to protest in advance. One participant, Saw Ah Wong, described how he was motivated to attend the protest because of anger over the Union Solidarity and Development Party’s (USDP) active voter manipulation through the collection of advanced votes and the USDP’s use of names of citizens working abroad from government family lists being automatically cast in favor of the USDP. For me… I come to protest because I am not allowed to vote in this Junta-led election. I cannot say whether my vote will be the vote for the Junta-backed political party or if I am not allowed to vote for anyone. But I feel like this – as the candidate who is presenting for his ethnic or his people is not allowed to contest for the vote, his ethnicity is like an ethnicity unrecognized by the country’s government. I am not satisfied with that. Also, we know that since the end of December  and beginning of October , the Township Peaceful and Development Council headmen, the civilian militia, and other authorities in Karen villages and Mon villages near Kyainnseikyi Town, have organized villagers to vote in advance. Even though Kyainnseikyi is a town, in reality it a rural town [implying that it is not watched for election abuses]. 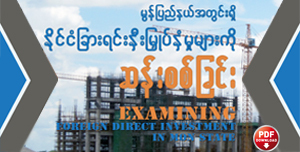 But the residents in the town have to give a check for the USDP candidate without their desire. 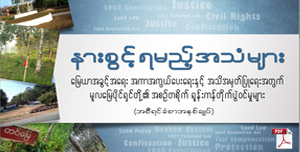 And most of regions have become the places where the USDP forces villagers to vote for it…. Here, we want to let everyone know instead of letting no one know. This is only able to be revealed by protesting it, and people learning about it and also the world. Two days later on October 25th two more protests occurred, in M— village, Kyainnseikyi Township, and in eastern Ye Township, Mon State. Both protests occurred in a similar fashion, with nearby communities turning out early in the morning and dispersing before noon. The protests in M—village drew almost 500 participants and the rally in eastern Ye Township drew over 600 participants from 28 surrounding villages. The rally in eastern Ye township, which was also conducted close to a Burmese army LIB, No. 591, has previously been documented experiencing frequent election related abuses. Like the October 23rd protest, witnesses have reported USDP efforts to collect advanced votes, and violations of election law by the pro-government party such as casting absentee votes automatically in their favor, are major points of anger for protest participants. Another significant cause in all three election protest was the perceived absence of vocal anti-election sentiment, according to several organizers. These communities, despite often times sever security restrictions by local SPDC battalions, are aware of the evolution of the current political situation. 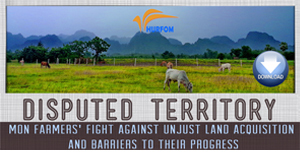 As noted by the Karen Human Rights Group’s (KHRG) 2008 report Village Agency, this is opposed to the confused perception that only urban centers, like Rangoon, are sites for political action or resistance. Being aware of the political climate at the local level, these protest indicate recognition by villagers, that other communities are also actively tuned into the current political situation, also despite SPDC efforts to restrict dissenting information, and could be inspired to voice their political discontent. By staging protests in close relation to local battalions, these communities have shown that the target of protests is still the regime, and by so visibly conducting a demonstration, is most likely to draw attention from Naypidaw, and international observers. Witnesses have indicated that in all three cases protests went off smoothly with out security disruptions or a crackdown by local battalions. According to one participant from eastern Ye Township, where the protest was held close to a Burmese battalions, “Until now we have heard that no one [no protest participants] has been arrested by the Southeast commander-led battalion and regional authorities yet. But the persons who led the protest have to hide for their security.” The success of these protests has been attributed to the strong local connections and community amongst villages and an awareness of the security threat from possible outside sources and local battalions. This protest has started since this morning at 7 AM, and it is a guerilla protest …. to gather quickly and to separate quickly.. that is because of the security awareness. And the protest was over at 11 AM. The 2008 constitution was drawn only for one side – the SPDC’s side. Since then, we have been protesting. Not that we have just started to protest now though. We protest because we want to get rights: ethnic rights, and rights to self-expression. Why do we have to support this predictable the-Junta-is-going-to-win election since it does not grant all rights for everyone? We also want to let the Burmese people who are in other villages, other townships, and other states and divisions know that we are totally against this unfair Junta-led election. We also do not want to keep listening to the military regime – [we want to] stop doing what the Junta wants and stop shutting up our mouths to whether we can speak up [or not] – we want [for] all [of us] to come together and protest together. We all will face with any upcoming danger, and as we work together, we will face [the danger] together. And that is the reason why we protest. 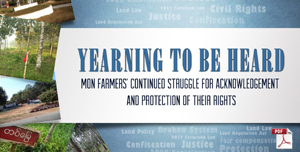 The occurrence of protests of over 1700 villagers in rural eastern Burma is a strong indicator that despite pressure on local communities by the SPDC to support the pro-government parties, and active attempts to suppress dissent, communities retain a sense of political activism and agency that they choose to express in appropriate settings. In these cases, protest organizers have been able to asses the risks of conducting large scale protests within their communities, recognized which areas would be best able to attract attention for the protest, and as indicated by accounts above, used tactics that would best ensure the security of the participants. 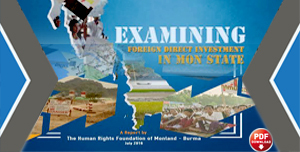 HURFOM hopes that these accounts will indicate that local communities in eastern Burma are actively aware of the political climate of the country, their region, and see themselves as potential agents in sharing knowledge and awareness within the community. 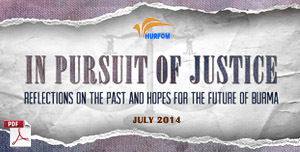 For further information related to election abuses in Ye Township, please see HURFOM’s September 2010 report, 35 Days Till Election: how state resources and area restrictions impact ethnic votes in Mon and Karen States.